This is the forty second in a series of reviews of the best dive resort locations around the world. In this post, the focus is the Canary Islands. Background – Set only 100 kilometers (62 miles) west of Morocco, an Autonomous Community of Spain, the Canary Islands consist of 7 main islands and a number of smaller ones and islets. They are of volcanic origin with a semi-arid climate and varied landscapes of mountains and primary forests in some locations and sparse, barren and desert like terrain in others. The total area is 7,493 square kilometers (2,893 square miles) and has a length of 550 kilometers (344 miles). During the time of European colonization starting in the 14th century they served as a stopover for galleons in transit. Today there is a thriving economy based on tourism, construction and cultivation of tobacco, bananas, and a number of other fruits and vegetables. Tourism makes up 32% of GDP with 16,000,000 visitors annually. People come for the pleasant warm climate, intriguing landscapes, natural environment, seaside atmosphere and bustling, modern city life, if desired, or quaint peaceful villages, if that suits the fancy. The population of 2.2 million includes 82.5% that are Spanish born and the rest made up of people originally from Morocco, Italy, Venezuela, Cuba and the Dominican Republic. Spanish is the language spoken by all with English also widely in use. Undersea World – With its geographical position the Canaries are the recipient of trade winds, cold oceanic currents, Canary current and the warm Gulf Stream which provide a mild climate and lots of nutrients coming from more tropical areas. While there is not much coral growth, there are some spots with anemones, soft coral and black coral. Notwithstanding, there is very rich sea life with 550 fish species and 1,000 invertebrates. They have a varied seascape to live on created by volcanic activity that has caves, ledges, lava flows and boulders that have provided a lot of places for macro life and fish to thrive around, among them parrotfish, boxfish, drummers, moray eels, garden eels, crabs, sea urchins, nudibranchs, octopus, cuttlefish, scorpionfish, trumpetfish, damselfish, pufferfish, glass-eyes, goatfish, triggerfish, and seahorses. 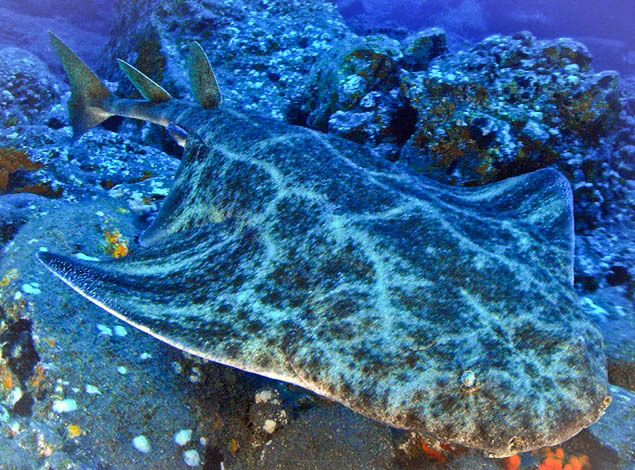 What is most attractive to divers is the multitude of large animals inhabiting the waters around the Canaries. These include groupers, jacks, marlin, tuna, mobulas, common and marbled stingrays, eagle and manta rays, blacktip, whitetip, nurse, guitar, angel, hammerhead, mako, bull, silky and whale sharks, 400 resident pilot whales, sperm whales, beaked whales, false killer whales, orcas, dolphins, and 5 species of turtle (green, hawksbill, leatherback Kemps Ridley, and loggerhead). The fauna and seascapes vary from island to island. Gran Canaria and Fuerteventura have 50 shipwrecks in the vicinity. El Hiero and Lanzarote have a more dense and diverse array of life. The dive sites of Tenerife are sheltered from the winds by the El Teide volcano and have Atlantic fauna. The mammals and pelagics are there year round with the mantas most prevalent in September. There are also 3 MPAs (Marine Protected Areas) in the Canaries where no fishing, mining or boating is allowed. These are El Cabron off Gran Canaria, Mar de las Calmas off El Hierro, and La Graciosa off Lanzarote. To check out liveaboard diving opportunities, click here: liveaboard diving. Seasons and Conditions – Air temperatures are mild with average highs in January of 16°C (60°F) and 23°C (74°F) in August. Correspondingly water temperatures in January are 19°C (66°F) and 23°C (74°F) in August. This is cool enough to consider wearing a 5-7 mm wetsuit or drysuit with a hood and gloves. It is a pretty dry climate with more rain from October to April when up to 9 days a month have rain of no more than 43.2 mm (1.7 inches) total per month. Visibility is typically 30 meters (100 feet) or more. Currents are generally mild. There are at last count 118 dive shops on the Canaries providing a full range of services, equipment rental, dive courses and guiding. There eight airports on the 7 main islands with 4 of them handling international flights. For between island travel there are flights, and fast and slow ferries. The islands all have taxi and bus service. The buses have varying levels of frequency and routes depending on where you are located. Cars, motorcycles and scooters are available to rent. All the islands have full service dive shops. A number of the hotels will have them, as well. I have read that there are 118 shops available providing full services including equipment rental, dive courses, guiding and cruises year round. There are hundreds of resorts, hotels, guest houses and condos available on the Canaries from $13 to $1,366 per night. The website linked below is a good source for the available options and can arrange booking. To navigate to different locations within the Canaries on the website, enter one of the city names from the map above or the one on the accommodation website into the search box at the top left of their page. The Canary Islands have a unique history and culture and fantastic volcanic terrain with a varying natural environment from island to island. There are many fascinating things to do when you are not diving. Here are some possibilities of things to see and do: black and yellow sand beaches, water sports, volcanoes, caves, forests, landscapes, nature tours, water parks, aquariums, historic buildings and churches, museums and galleries of all kinds, local restaurants and cuisine, gardens, shopping, city and village tours, music and nightlife. It is a very rich cultural scene with countless activities. Please check out the video below for a glimpse.